At Jul 5, 2018 there was announced about Jojo Bizarre Adventures : Golden Wind that will be aired at October 2018. When i see the first pv of the anime version of Jojo part 5, Giorno's clothes color looks like this. 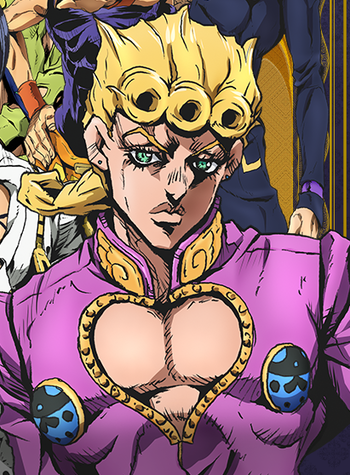 I know that some of Jojo part 5 manga's cover has this color (pink) for his clothes like volume 54 and volume 55 but it's only the cover, like many other Jojo manga's cover that have many artistic colored clothes, background, lips and so. Why did they choose pink for giorno's clothes ? Because apparently there is no canon color scheme to JoJo's. When Jojo became an OVA, one of the animators asked Araki "what color if Jotaro?" however Araki had no such concept. He colors everything based on calculation. 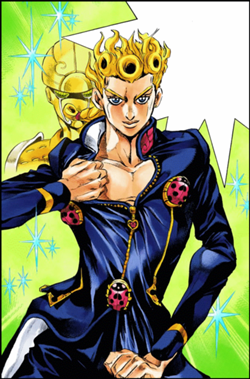 For example, in Volume 54 Giorno's clothes are pink, but in Volume 63 they are blue. As praraphrased by Super Eyepatch Wolf, "he doesn't view his world or characters in any consistant color palet". Dunno. Looks good on him? I'm betting the production staff had some freedom when it came to the color palet given Araki's attitude towards colors. Also, as stated, the color scheme has been seen in past media such as the covers mentioned. The production staff may have also wanted to differentiate themselves from previous color choises. The blue was the color of choise for the DIGITAL COLORED COMICS version, which I think the picture in the question originates from, as well as games such as All Star Battle and Eyes of Heaven. What is the connection between Stands and Ripple Energy? Why did the stand “Notorious B.I.G” change to “Notorius Chase” in the anime?